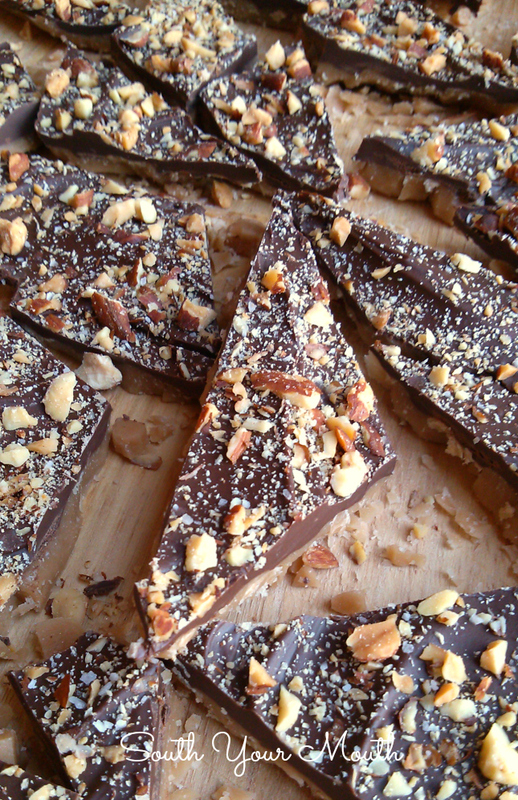 An easy, no-fail English toffee recipe topped with chocolate, almonds and coarse-grain salt. Not to sound like that annoying Facebook friend who loves to “humbly” brag about how much she accomplished in a day… but… y’all, I had it going on today. I was on fiyah! Said or sung in your best Adam Levine or Alicia Keys voice – either will work. I actually had a Facebook post typed out to send to y’all about what I’d done all day but when I read over it I was like dang, heifer, brag much? so I deleted it. I was just feeling so great about having accomplished so much in one day! Husband even got into the spirit and decided to clean out our master bedroom closet. What the what?! We so grown now. Anyway, one of the things I did today was make this toffee! This is da bomb dot com. Candy making has always scared me a bit because a) I can never find my candy thermometer and I’m not even sure if it works right; b) it usually requires perfectly coating something in melted chocolate and I do not (repeat: do NOT) have the patience or attention to detail for that; and c) there are just too many things that have to be perfect – there’s not much freelancing in candy making. 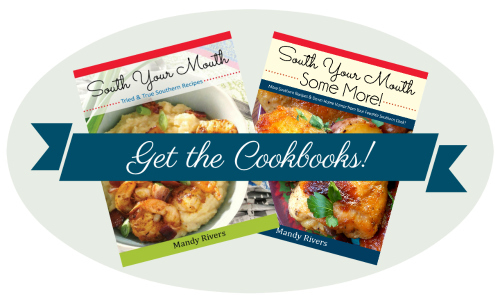 But this recipe has never failed me! I don’t use the candy thermometer. I just cook it until it’s the color toffee is supposed to be. It doesn’t get darker or lighter after you pour it out so as soon as you see the color you’re after, you’re done. Boom. I tried to be pretty detailed when I wrote this out because there are some things you have to get right but don’t let this scare you. Just read the recipe completely before you get started and you’ll be fine! Line a 13x9 baking pan with aluminum foil; set aside. Heat butter, sugar, vanilla and 1/4 teaspoon salt in a heavy-bottom saucepan over medium heat until butter is melted; stirring slowly* with a wooden spoon. Once butter has melted, increase temperature a little (set between medium and medium-high) and continue to cook and slowly stir* until mixture starts to boil. Once boiling, continue cooking and slowly stirring for approximately 7 minutes or until toffee is light brown in color (the color of an almond or, well, toffee!) or 290 degrees on a candy thermometer. Without scraping the bottom of the saucepan, pour the toffee into the prepared baking pan. Using a rubber spatula, spread hot toffee evenly into pan. You’ll have to work quickly as the toffee will start to set up. Wait one minute then sprinkle chocolate chips evenly over hot toffee. Wait another 1-2 minutes for the chocolate to get soft and become pliable then spread the chocolate evenly over toffee. Sprinkle chopped almonds over melted chocolate. Sprinkle a little coarse-grain salt over almonds. Let toffee rest, uncovered, at room temperature until chocolate is set. Once everything is completely cool, you can refrigerate for 10-15 minutes to help the chocolate set more quickly. Not longer than this or not until everything is completely cool or the chocolate could form condensation. Once everything is completely firm, lift up on the aluminum foil to remove the toffee slab from the pan. Cut toffee into pieces using a sharp knife (the more imperfect, the better, I think!). Store toffee at room temperature in an airtight container. Save all the little broken bits of toffee in a zip-top bag to add to the next batch of cookies you make. I swear these little bits are magical in chocolate chip cookies!! *You can’t stir this too fast or the toffee could “break” and the oil in the butter could separate from the mixture. You want to be sure to scrape the bottom of the pan while you’re stirring so that no “hot spots” develop on the bottom of the pan. If it seems your toffee is “breaking” stop stirring for 15-second intervals to let the toffee come back together. Oh yum! Having to use a candy thermometer was one of the things that kept me from every making my beloved toffee. Thank you for making it very approachable! I think we will be having us some toffee this Christmas. And I hope that you and your family have a wonderful Christmas and a very happy, healthy New Year! 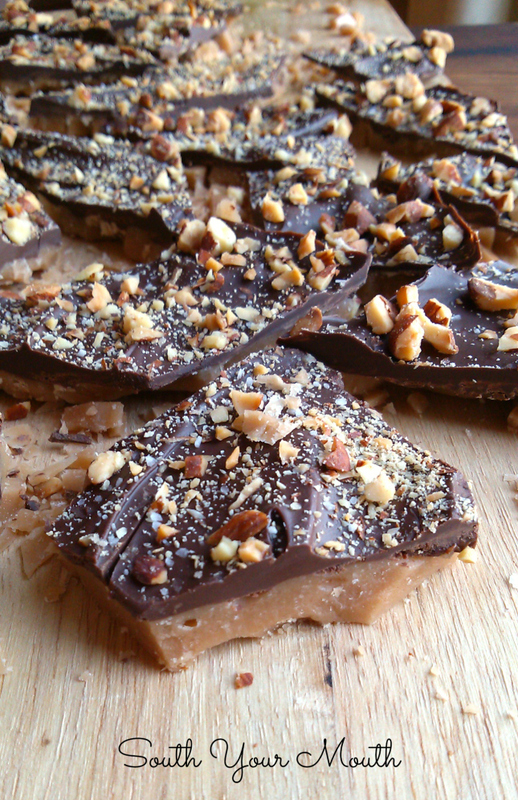 I make candy nearly every Christmas, but I have always been to afraid to make toffee. I always thought it might be too hard. This recipe sounds very doable. Thank you for sharing it. Oh hello! Those look so yummy!! I love getting your emails/recipes!! Looks amazing. Pinned so I can make it later. Just made these and I can't wait to try one! I made this and it was a huge hit with all my friends!